A hangover, medically known as veisalgia, is caused due to the consumption of large amounts of alcohol or some other drug. Hangover is most commonly associated with the after-effects of large consumption of alcohol. This article summarizes the cures and remedies available for alcohol hangovers. A Hangover is a commonly experienced phenomenon after heavy consumption of alcohol, the amount of which is determined by various factors like diet before drinking, physical condition, age and mental state. Statistics show that while an average person may experience a hangover with as many as four to five drinks, some may also experience it with as little as two to three while there exists a small percentage of people who may show a resistance to the effects of a hangover. Commonly faced effects of a hangover are dizziness, dehydration, fatigue, sensitivity to light, lack of concentration, irritability, headaches and sensitivity to sound. In greater degrees, a hangover is known to cause vomiting, diarrhea, flatulence, nausea and erratic motor functions. Besides these, various physiological side effects like depression and anxiety are also common. Your mouth will feel very dry and you will feel that strong urge for wetting your tongue and throat. Heads feels very heavy and sometime here could be throbbing and painful. You feel sleepy and drowsy. Your eyes may look swollen and will be slightly or very red in color. Your eyes may also dislike exposure to light. Strange sensation in the stomach with a feeling of nausea and vomiting. You feel drowsy when you wake up. There is a very strong urge of going back to sleep. A hangover is however not a serious health condition although some of the hangover symptoms like chills, diarrhea, dizziness and fever can be quite disturbing, and there are plenty of hangover headache remedies and home cures for a hangover headache. Most hangover remedies involve food hangover cures like consuming bananas cd, and there are some that work, provided you aren’t throwing up. If you are vomiting or experiencing diarrhea then it would be best to consume some oral rehydration solutions to prevent dehydration. This also cures hangover nausea and fatigue. When looking for hangover cures for vomiting, food and exercise may not be the best idea. Ethyl alcohol or ethanol causes a lot of dehydration which causes your mouth to go dry and also is responsible for the heaadaches. So what causes a Hangover? A hangover is caused by excessive Ethanol being introduced into the body, this causes an increase in urine production which dehydrates the body leading to a decrease of essential fluids in the body and especially the brain which is the main factor which results in headaches and a feeling of lethargy. Ethanol which is universally used as the intoxicating agent in alcoholic drinks, is broken down by the body to form acetaldehyde by the enzyme alcohol dehydrogenase which is then further broken down to form to acetic acid (vinegar)from acetaldehyde by the enzyme acetaldehyde dehydrogenase which is found in the liver. Acetaldehyde is actually known to be more toxic than alcohol and is found to be anywhere between ten to thirty percent more toxic. The mood disturbances, fatigue, weakness and compromised attention span and concentration can also be attributed to the way the body converts NADH from the coenzyme NAD+ Nicotinamide adenine dinucleotide) which is a coenzyme found in all living cells. An excess in the production of which can result in the enzymes of the Citric Acid Cycle being inhibited and thus in order to account for the increase of the resultant Pyruvate, which is formed at the final stage of glycolysis, the excess NADH produces lactate from the resultant pyruvate to recreate NAD+. Due to the drop in pyruvate, its path to gluconeogenesis which generates glucose is obstructed and diverted. Since glucose is the body’s primary source of energy and especially of the brain, this result in the effects described above, such as mental tiredness and fatigue. Alcohol also effectively decreases the livers functionality and its ability to produce glutathione which acts as a detoxifier in the body. This greatly reduces the body’s capability to flush out toxins and importantly acetaldehyde from the bloodstream. Also, alcohol induces the creation of the enzyme CYP2E1 (Cytochrome P450 2E1) in the body which along with being an important enzyme for the conversion of ethanol to acetaldehyde is also known to be the cause of additional toxins and other free radicals. It is also believed that in the fermentation of alcohol, certain by-products called congeners are released. These congeners heighten symptoms of a hangover caused by excessive intake of alcohol. Congeners are found in higher concentration in darker alcohol like bourbons and in much lesser quantities in lighter colored alcohols like vodka, therefore, the hangovers called by darker alcohols are known to be much more pronounced than that of lighter colored ones. Consume a lot of water before you go to bed. This should priovde some relief to the dehydrating effects of alcohol. Drink lots of water even after you wake up. Its a good practice to eat something while and after your are drinking. 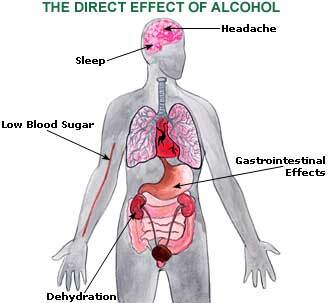 This helps reduce the rate at which alcohol enters your blood and thus can help reduce the after-effects. Take vitamin C tablets. These help break down the alcohol content in your body. Try to eat starchy foods to slow down the alcohol absorption. Limit yourself to less than 1 drink per hour. Stick to non-carbonated drinks as carbonation can speed up the alcohol absorption. Try to avoid sweet drinks (and sugary foods) while you drink. The sweet taste of the drink can make it difficult for you to judge how much alcohol you’re actually consuming. There is no absolute remedy that is accepted by modern medicine for a hangover; there exist however many home remedies for the same, some which have been passed down through generations and even being mentioned in certain folklore. One of the earliest recorded remedies for a hangover came from the ancient Romans who on the suggestion of Pliny the Elder (Gaius Plinius Secundus) took to consuming raw owl eggs while sometimes opting for fried canary. Through the years, the accepted remedy for a hangover still varied with 1878 Paris World Exposition demonstrated a cure composed of a mixture of raw egg yolk, Worcestershire sauce, Tabasco sauce, salt and pepper while in America, people took to consuming a mixture of Coca-Cola and milk. Known author Ernest Hemingway himself swore on tomato juice and beer as being the cure. • The hair of the dog: This involves consuming more of the alcohol that cause the hangover. While this causes a temporary sedating effect, the body is only more poisoned with additional alcohol and it only postpones the effects. • Steambath/Sauna: this can be potentially dangerous as cardiac arrhythmias can be easily caused with the combination of alcohol still in the system and hyperthermia. • Antacids like peppermint and chamomile tea may help quell an upset stomach. • Drink plenty of water or fresh juices to rehydrate yourself. One of the main causes of a hangover is dehydration, however skip acidic juices like orange and opt for apple instead. • Alcohol causes loss of potassium from your body. Eating a banana may help regain lost potassium. • Nausea can be treated with ginger. To counteract the effects of the same, drinking ginger-ale is highly recommended. • Sports drinks are highly recommended as they help regain lost glucose in the body. • Other clear liquids like soup are recommended until the stomach is strong enough for solid food after which easy to digest foods like toast are ideal. • Remember to keep the body hydrated while drinking, and even after, consume sufficient water before going to bed. And remember, a good cure for a hangover is plenty of sleep so get a few more hours in than normal!